I know how hazardous mold can be so I also purchased the safety kit with the biocide 100 and everything worked great. Light and easy to breathe through, I don’t feel like I’m struggling for air like with some respirators. The filters protected me form the mold spores, I can’t smell any mold when I’m wearing this mask. This is a great respirator. Strongly recommended. materials making it tear and puncture resistant. Ensure convenient and reliable respiratory protection against mold and mold spores when working in a mold contaminated environment with the practical features and comfort of this halfmask respirator. 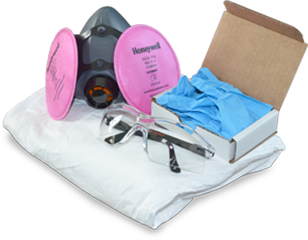 Our particulate filter provides 99.97% Protection from airborne mold fine particulates. Having an effective mask and filter system is crucial when cleaning or handling any fungal contaminates. We offer you the gold standard in affordable and effective respiratory protection with this disposable particulate filter. There is a 15% re-stocking fee that applies to all returned or refused products.